What’s pretty in pink this Valentine’s Day? 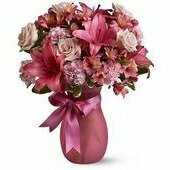 A versatile bouquet of mixed pink flowers is perfectly appealing and will give wonderful memories to a loved one, always and forever. A thoughtful gift for a favorite friend, mother, grandmother or anyone special.